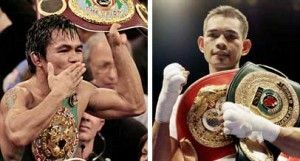 Eight division world champion, Philippine senator and “Fighter of the Decade” Manny Pacquiao is back to his old devastating punching machine while WBO super bantamweight champion Nonito “The Filipino Flash” Donaire is looking amazing. ABS-CBN reporter Dyan Castillejo told the Manila Standard that Hall of Fame trainer Freddie Roach revealed “his left shoulder was hurting tremendously while Buboy Fernandez also complained that his elbow was hurting because of Manny’s punching power” in seven rounds on the punch-mitts. Roach complemented Manny on his footwork during six rounds of sparring with Rey Beltran on Friday, Manila Time, and said “Manny is exactly where we wanted him to be. In an interview with The Main Event, Donaire laughed off unbeaten Jessie Magdaleno’s decision to dye his fair to boost his confidence. He said he won’t have any problem going twelve rounds if he has to.